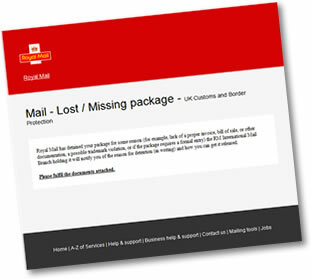 We have been contacted by a number of customers regarding an email they have received supposedly from the Royal Mail regarding a Lost or Missing Package. However DO NOT be tempted to open the attached Folder - this email IS NOT from the Royal Mail - it is a SCAM email containing an Executable (.exe) File that could infect your computer with a Virus or Trojan. Although a large number of these SPAM emails have been of the 'Royal Mail' style, there are many other versions too. These include emails that have supposedly been sent from 'Barclays Bank' (regarding a Transaction Notification), 'UPS Parcels' (regarding a Delivery Notification/Tracking Number) and 'Amazon' (regarding Your Order Details) to name just a few. As indicated above, the main common factor between all these emails is that they have an attached ZIP Folder... inside this Folder is a file ending in .exe - this is an Executable File which is capable of installing a program on your PC... in this case a Virus or Trojan. NEVER CLICK/RUN AN .EXE FILE FROM ANYONE YOU DON'T KNOW! The Banks, Royal Mail, Couriers, Online Shops etc will NEVER send you a .EXE File, FULL STOP!!! Because these .EXE files are contained within a Zipped Folder, Server Side Anti-Virus protection cannot 'open' the folder and look inside not least for Data Protection reasons. You should now be protected from .EXE files within .ZIP Folders.